This hike was one of my last 3 hikes to complete my goal of hiking all the trails in the Clackamas District. The section I needed was the short section of PCT north of Ruddy Hill. I had tried to do it last year, but there was too much snow at the time. 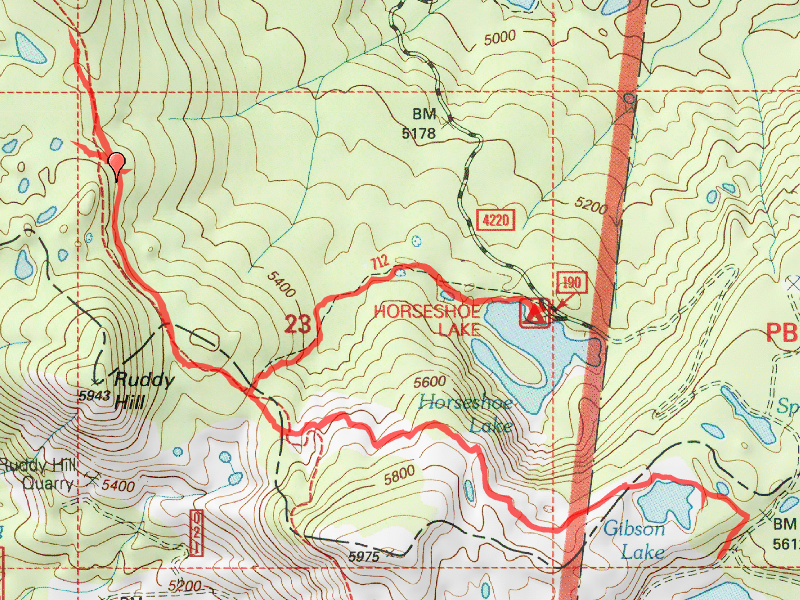 Since that was a pretty short hike, I thought I would add in the Gibson Lake trail as well, since I didn’t have a track of that trail, and it had been quite some time since I had hiked that trail. The trip to Horseshoe lake was pretty non eventful, although that road keeps getting worse, year after year. There are some pretty washed out sections of that road now. After getting to the Horseshoe lake campground, we parked and headed up the Horseshoe Saddle trail. This trail is a little confusing at the start because there are user trails all over the place at the Horseshoe Lake campground. Basically, just follow the trail that leads next to the lake and you’ll soon be out of the maze of user trails. It is pretty level for a while, until the last few tenths of a mile – then you have to work to get to the saddle. The trail is well graded up to the saddle, and there were a few trees across the trail, but nothing huge. At the saddle, you hit the PCT. We briefly stopped here for a water break, but quickly started down the trail, as the bugs started finding us. The bugs weren’t bad, especially when hiking, but when you stopped, they did tend to find you and were kind of annoying. The PCT was well manicured (as usual), with nothing terribly unusual. We recognized the section where we turned around last summer due to the snow (8 feet of snow on the trail! ), and continued a little farther. When the trail started heading uphill, we decided we had gone far enough, and turned around. On the way back, Kirk noticed what looked like a side trail (definitely not something natural looking), so we we followed it up to explore. It kind of petered out a little bit up the hill, but the beginning certainly looked like a side trail. We continued on down to the Gibson Lake junction and took off to Gibson Lake. The sign says 3/4 of a mile, but it is a little further than that. Probably just over a mile to the lake. We got to the lake where there was a rather large family swimming in the lake, having a great time on a sunny summer day. We stopped at the east end of the lake to eat lunch and to dip our feet in the water. It was a nice break. After eating, we continued on the trail down to road 4220, where the trail ends. We turned around and headed back up the trail, and back to where we came. Since we still had time left, we decided to do some more exploration on the old Skyline trail, but that is in a separate trip report…..This was a neat half day romp in an interesting section of the forest.